TVB to Cast Kevin Cheng or Chilam Cheung in “Hanzawa Naoki” Remake? TVB has purchased the copyrights of Japanese drama Hanzawa Naoki <半沢直樹> in hopes of remaking a Hong Kong version. Revolving around the banking industry, the series achieved 42.2% ratings in its finale and broke ratings records in Japan. Chilam Cheung (張智霖) or Kevin Cheng (鄭嘉穎) is rumored to be the lead. Believing that the drama can be adapted to the Hong Kong scene, TVB senior executives are convinced that the sufferings and plight of the oppressed in the banking drama will resonate strongly with the working sector in Hong Kong. Many netizens expressed earlier that Roger Kwok (郭晉安) or Michael Tse (謝天華) will fit the title role while Pong Nan (藍奕邦) seems to be the ideal candidate for the villain role. However, TVB prefers to cast either Chilam Cheung or Kevin Cheng, who has managed to make the commoner lawyer, Law Ba, a household name. TVB believes that the two actors would be able to bring out the dual characteristics of gentleness and cynicism of the main role perfectly. Both actors expressed interest in taking part in the series. Chilam said, “I need to spend more time looking into the role. I know this show was a hit. It was the highest grossing drama. But I have only seen a few minutes. I haven’t finished it but will definitely watch it.” Chilam believed that if he were given the role, he would revamp the role to suit his style and his co-stars. In addition, TVB has also bought the broadcast copyrights of the series from Japanese television station, TBS and the first episode will be released on November 16 in the paid channel. Hong Kong is the second country after Taiwan to release the drama. Because of TVB and TBS’ good relationship, TVB is currently running Legal High <律政狂人>, another series featuring Sakai Masato. The actor, together with actress, Aya Ueto , will be in Hong Kong next month to promote Hanzawa Naoki. 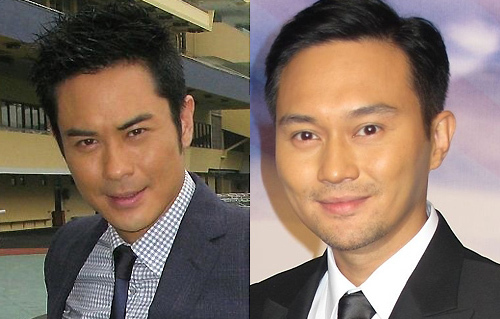 52 comments to TVB to Cast Kevin Cheng or Chilam Cheung in “Hanzawa Naoki” Remake? Kevin…… I miss seeing him in tvb series. Wow, two handsome guys together in one drama series ………….. it will definitely attract a lot of female viewers. i’m more anxious who will be the female lead tvb is going to recruit…. Charmaine Sheh will be good for these two actors ……. in terms of age and acting. Charmaine and Chilam back together onscreen? GOLDEN! I don’t think Anita Yuen would permit it. Ha ha ….. I do miss Charmaine & Chilam’s chemistry and it would be nice to see them collaborate again, regardless of the series. I don’t think Anita would mind, she already matured much in thinking since giving birth to Morton. Sandcherry, I think Anita should be fine with Charmaine. I think she will always be wary therefore I don’t think she will be fine after all those rumours and liking. Watched Anita’s interview with Steven in be my guest, she said that the “feud” between her and charmaine are rumours made up by paparazzi. The famous incident when she was visit the set of point of no return, to keep an eye on chilam, in reality, she invited all of them to have lunch at a Cha chaan teng. Even charmaine was there. Well anyways, I really hope charmaine and chilam would film in another series together. hey at least they bought a copyright this time, instead of shamelessly denied plagiarism like they did before lol. @kk: Haha…you took the words right out of my mouth! Their problem is that for years, they would ‘lift’ ideas from other shows or blatantly ‘remake’ a series and despite 99% of the series being the same, they still deny that anything is copied. At least this time around, they were willing to fork out money to purchase the copyright and are making it clear from the beginning that they are making a HK version of the series…. I’m fine with TVB doing remakes of other countries’ shows like this as long as they give proper credit. Sure, but what’s the point of remaking it if you also bought the broadcasting rights to the original drama? Just air it dubbed as they usually do. Seriously no originality in TVB anymore these days. chilam is definately a better choice than kevin,roger is the best choice.but i think tvb wouldnt give him the lead,because his fame is not as high as the other two now. Roger is the better actor. But the role of a banker or financier should go to Ruco. Why? He already looks like a well dressed and like an accountant except lose the glasses and maybe he looks less like a serial killer. I think Gallen Lo can nail this role with his eyes closed, although he may not take the role. Roger and Ruco are also good picks, although Ruco may be a bit on the younger side to portray the role. Both Roger and Ruco’s recent series have not gathered exceptional ratings, so doubt TVB will give such a heavy role to them. TVB may chase after Kevin, as Chilam may be busy with the “Triumph in the Skies 2” movie along with other new projects after signing with Stephen Siu Jr.’s company. If they are looking at Chilam or Kevin, how can Ruco be too young? This is the character that will be cheated? Accused? Then got mad and get even? Because I haven’t seen the Japanese version. If true, can Chilam do the “OMG I HAVE BEEN CHEATED?!?! ?” and then “I WILL GET YOU FOR THISSSSS” but looks calm enough to carry out his act of revenge? I know Kevin can’t so let’s hope Chilam can because Roger can. I want Roger in this role. Chilam is more like “Oh really, I was duped? Oh well I might as well fight back to get something in return… but let me do my manicure first…” sort of performance. I think Roger is a good actor and can act out those expressions. Although he needs to dress better to look like a banker. Kevin is not suited for this role. His acting is too dead pan. yeh lets hope chilam can do this. i also doubt if chilam can do this kind of expression.i never seen him as a revengeful villainous guy. i thought the same with roger until i saw him in last on standing. and im astonished.his cunning cold-blooded expression is sublime.especially if you think he is ah wong and you can imaging how good his acting is. I firmly believe Roger can act anything actually, so yeah he would be a good fit. But actually, I thought Kevin was pretty good in Last One Standing where he was portraying the BETRAYED I WILL GET REVENGE type. Though, I’m not sure he has the chops to also be the subtle, revengeful type which Roger will definitely nail and has in the past. As for Chilam, no clue. Though if he wants to capitalise on his Captain Cool popularity, it could be a good idea to do another new type of character for him – if he can. Ray is a veteran actor with over 30 years of acting experience so is it fair to compare them to Ray?? Oh I know but I was just saying that it isn’t fair to compare Kevin and Chilam to Ray since they are from different generations. michael tse – no no no no, pretty sure he will have that laughing gor mannerism again, i don’t need to see another laughing gor undercover in a bank. kevin cheng – he either will act out law ba again or look confused most of the time. chilam – not sure, but he will be pretty to look at lol. roger – perfect choice imo, but not sure if tvb will even consider casting him for this role since atm chilam and kevin are more popular than him. ChiLam looks too nice to be a cold,heartless banker. Kevin might be more suited to that role out of the 2 choices imo, but I agree with the netizens on Roger Kwok or Michael Tse fitting it even better. If TVB is going to choose kevin cheng in this series, then I think TVB should chooses Charmaine Sheh for female role. Kevin Cheng and Charmaine Sheh would fit perfectly pair and are perfectly couples. Kevin and Charmaine have zero chemistry. If based on chemistry, might as well get Chilam since he and Charmaine are known for great chemistry. That is if the female lead is even Charmaine. She’s already committed to the police drama they are filming in January so she might not want another if this one is also filming next year. who is 藍奕邦? has he acted before? 藍奕邦 is a singer, music producer, lyric writer, etc. He acts occasionally. Haha some netizens online want Elaine Yiu to be the female lead! If they do produce this drama, I really hope this comes true! Ohemgee , they’re planning to remake this amazing Jdodrama ? Hanzawa -San is a very calm banker. He doesn’t look strong to other banker, quiet but oh my when you get in his way you better prepare for “double payback” I can’t think of any TVB actor that can act Hanzawa-San . And they have to have a very strong supporting cast too because the supporting cast in the Japanese version are no joke either . I love both TVB productions and Japanese dramas but can they leave my fav Jdorama of the year alone ? Please ? And Hanzawa san is not a cold heartless banker/man . He’s a really nice man to his friends even when they betray him . He loves his wife. He helps everybody he comes accoss if he could . He’s just quiet, calm , super smart and full of compassion for his job . i havent seen this serie,ok if he is how you have describe him,then i have just one chinese actor who can play this character and that is damian lau. but i think he is too old for this character. or not? You had to go and mention Felix Wong! I absolutely loved him in The Silver Tycoon and his character there sound pretty similar to the main character in this drama. Both Gallen and Nick would be amazing too. Kevin doesn’t really have the subtlety that this character seem to require so if between him and Chilam, I’d go with the latter just because I think he has more range than Kevin. Only will watch it if Julian Cheung is d leading man TVBBBBBBBBBB!!!!!! I want to see Kevin !! Somehow I feel none of them can measure up to Masato Sakai. I don’t see either one of them as Hanzawa, definitely see more of Hanzawa in Roger. But.. I’m always happy to see more Chilam back on my screen. Seeing as this is a TVB drama, please don’t drag it out to 40 episodes, just.. please. Don’t. Unless they plan on the remaking the second season too. Between the two I would say Kevin would fit the role better as he can be a cool and calm character with ease. I do think he can act ruthless too given the opportunity to do so. Chi Lam’s looks with his pretty dimples don’t make him look a “cool” and perhaps calculating entrepeneur. His looks are too boyish. Roger is a very talented veteran actor. But somehow, TVB does not promote him much. I don’t know why but he is not getting the fame he should be given his acting skills.